If you use tab colors to organize your worksheets, run this macro to quickly show specific sheets, based on the selected tab color. All other sheets are hidden. Select "(All)" to see all sheets again. 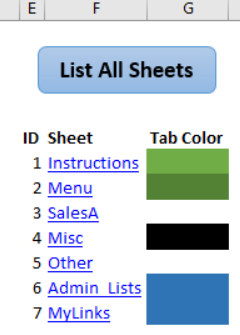 Instead of scrolling through all the sheet tabs, in a workbook with lots of worksheets, use a drop down list to show only the sheets with a specific tab color. When you make a selection, a macro runs, and hides any sheet that doesn't match the selected color. You can download the sample file, to see how it works, and the setup details are shown below. This video shows how the drop down list is set up, and shows how the macros work. There are instructions for setting up this technique in your own workbook. In the sample file, there is a Menu sheet that has a drop down list. Then click on one of the options, such as Admin. When you make a selection, a macro runs automatically, and hides all the sheets, except for the ones that have the tab color you selected. The Menu sheet is always visible too. 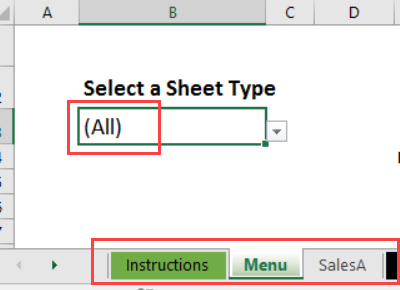 To see all the sheets again, select the (All) option in the list of Sheet Types. The items in the drop down list are stored on the Admin_Lists sheet. Here are the details on using that list. 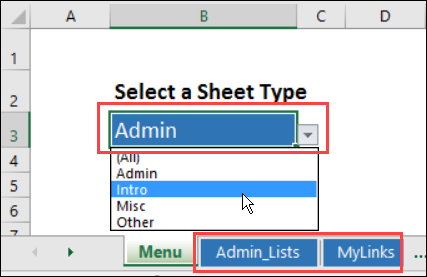 To see the list of sheet types, go to the Admin_Lists sheet. 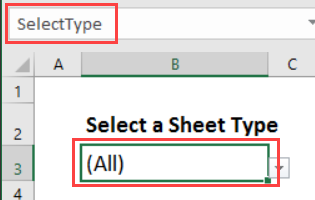 The sheet types are listed there, in a named Excel table. The items in that table were selected (not the heading cell), and named as SheetTypes. Type a new item at the end of the SheetTypes list, and the list will expand automatically to include the new item. Sort the list A-Z, after adding new items – there is a bracket at the start of “ ALL”, so it should always sort to the top of the list. Use a fill colour that matches the tab colour for that group of sheets. Optionally, you can also change the font colour, so the text is easier to read. That does NOT affect which sheets are hidden. Use any text that you want to, when describing the sheet type. Descriptive names are used in this example (Admin, Misc), but you could just use colour names instead (e.g. Blue, Green, None). 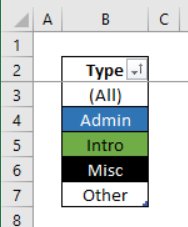 There are two formulas on the Admin_Lists sheet, to find which sheet type was selected. In cell F1, the formula is a simple link to the SelectedType cell on the Menu sheet. In cell H1 (named SelTypeNum), there is a MATCH formula, to find that sheet type in the SheetTypes list. It returns the position number. If the MATCH function returns an error, because the sheet type is not found, the IFERROR function will return a 1. Since (All) is in position number 1, all the sheets will be visible. On the Menu sheet, there is Worksheet_Change code, that runs when any change is made to the sheet. If the SelectType cell was changed, a macro runs. First, all the sheets are made visible. Then, if (All) was selected, or if the selection cell is blank (""), nothing else happens. If any other sheet type was selected, the macro hides any sheet with a tab that does not match the selected colour. The Menu sheet is left visible too. MsgBox "Could not show the sheets"
The Menu sheet also has a list of all the sheets in the workbook, with a link to each sheet, and its tab colour. Above the list of sheets, there is a button that runs runs the ListSheetsTab macro, to update that list. The macro code is shown below. The following code creates a list of sheets in the active workbook, and puts the list on the Menu sheet. The list will start in row 4 (lRowHead = 4), and in column 5 (lCol = 5). You can change those numbers in the code, if you want the list in a different location. When the code runs, it enters an item number and the sheet name. Next, the ColorIndex property of the tab is checked. If that is -4142 (No Fill), then the sheet list cell shows No Fill as well. Finally, after all the sheets have been added to the list, the heading row is bolded, and the columns are AutoFit. The tab's Color property is used to fill the cells, because it gives accurate colours on its own. However, the Color property returns 0 (zero) for Black, and False for No Fill. Because False = 0, "No Fill" sheets would appear as black, in the list of sheets. 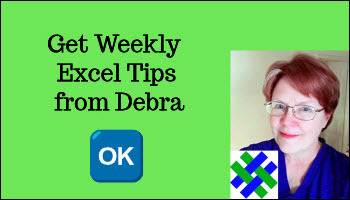 To prevent this error, the ColorIndex property is checked first, and applicable cells are formatted with No Fill. To test the macros, you can download the sample file with the code to show specific sheets in Excel, based on the selected tab color. The workbook is in xlsm format, and contains macros. Be sure to enable macros when you open the file, if you want to see how the macros work.